Runway visual range is an instrumentally derived value, based on standard calibrations, that represents the horizontal distance a pilot sees down the runway from the approach end. It is based on the sighting of either high intensity runway lights or on the visual contrast of other targets, whichever yields the greater visual range. RVR, in contrast to prevailing or runway visibility, is based on what a pilot in a moving aircraft should see looking down the runway. RVR is horizontal visual range, not slant visual range. RVR is reported in hundreds of feet, so the values must be converted to SM if the visibility in SM is not reported. [Figure 1-10] It is based on the measurement of a transmissometer made near the touchdown point of the instrument runway and is reported in hundreds of feet. RVR is used in lieu of RVV and/or prevailing visibility in determining minimums for a particular runway. Figure 1-10. RVR conversion table. Touchdown RVR—the RVR visibility readout values obtained from RVR equipment serving the runway touchdown zone. Mid-RVR—the RVR readout values obtained from RVR equipment located near the runway midpoint . Rollout RVR—the RVR readout values obtained from RVR equipment located nearest the rollout end of the runway. Far End RVR—when four RVR visibility sensors (VS) are installed, the far end RVR VS is the touchdown RVR VS on the reciprocal runway. The far end sensor will serve as additional information. RVR is the primary visibility measurement used by Part 121 and Part 135 operators with specific visibility reports and controlling values outlined in their respective OpSpecs. Under their OpSpecs agreements, the operator must have specific, current RVR reports, if available, to proceed with an instrument departure. OpSpecs also outline which visibility report is controlling in various departure scenarios. Another set of lower-than-standard takeoff minimums is available to Part 121 and Part 135 operations as outlined in their respective OpSpecs document. When certain types of visibility reports are unavailable or specific equipment is out of service, the flight can still depart the airport if the pilot can maintain adequate visual reference. An appropriate visual aid must be available to ensure the takeoff surface can be continuously identified, and directional control can be maintained throughout the takeoff run. Appropriate visual aids include high intensity runway lights, runway centerline lights, runway centerline markings, or other runway lighting and markings. With adequate visual references and appropriate OpSpec approval, commercial operators may take off with a visibility of 1600 RVR or ¼ SM. Ceiling is the height above the earth’s surface of the lowest layer of clouds or obscuring phenomena that is reported as broken, overcast, or obscuration and not classified as thin or partial. 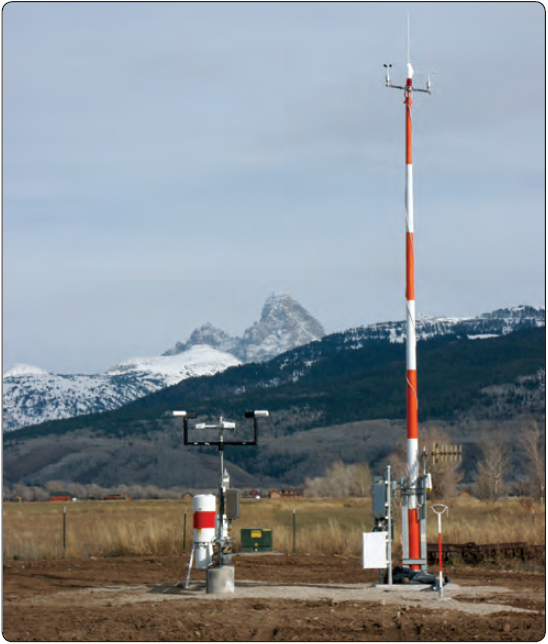 An automated weather system consists of any of the automated weather sensor platforms that collect weather data at airports and disseminate the weather information via radio and/or landline. The systems consist of the ASOS/ Automated Weather Sensor System (AWSS) and the AWOS. Figure 1-11. AWSS installation at Driggs-Reed, Idaho. Figure 1-12. CS entry for an AWOS station. The use of the aforementioned visibility reports and weather services are not limited for Part 91 operators. Part 121 and 135 operators are bound by their individual OpSpecs documents and are required to use weather reports that come from the NWS or other approved sources. While every operator’s specifications are individually tailored, most operators are required to use ATIS, RVR reports, and selected reports from automated weather stations. All reports coming from an AWOS-3 station are usable for Part 121 and Part 135 operators. Each type of automated station has different levels of approval as outlined in individual OpSpecs. 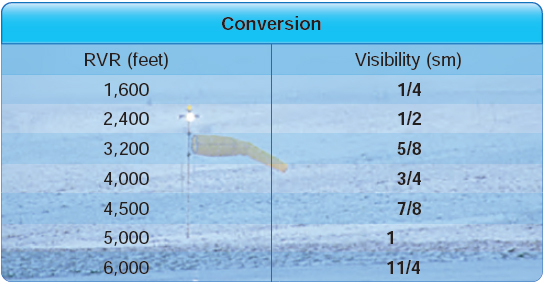 Ceiling and visibility reports given by the tower with the departure information are always considered official weather, and RVR reports are typically the controlling visibility reference. ATIS is another valuable tool for gaining weather information. ATIS is available at most airports that have an operating control tower, which means the reports on the ATIS frequency are only available during the regular hours of tower operation. At some airports that operate part-time towers, ASOS/AWSS information is broadcast over the ATIS frequency when the tower is closed. This service is available only at those airports that have both an ASOS/ AWSS on the field and an ATIS-ASOS/AWSS interface switch installed in the tower. Each ATIS report includes crucial information about runways and instrument approaches in use, specific outages, and current weather conditions including visibility. Visibility is reported in statute miles and may be omitted if the visibility is greater than five miles. ATIS weather information comes from a variety of sources depending on the particular airport and the equipment installed there. The reported weather may come from a manual weather observer, weather instruments located in the tower, or from automated weather stations. This information, no matter the origin, must be from NWS approved weather sources for it to be used in the ATIS report. The digital ATIS (D-ATIS) is an alternative method of receiving ATIS reports. The service provides text messages to aircraft, airlines, and other users outside the standard reception range of conventional ATIS via landline and data link communications to the flight deck. Aircraft equipped with data link services are capable of receiving ATIS information over their Aircraft Communications Addressing and Reporting System (ACARS) unit. This allows the pilots to read and print out the ATIS report inside the aircraft, thereby increasing report accuracy and decreasing pilot workload. Also, the service provides a computer-synthesized voice message that can be transmitted to all aircraft within range of existing transmitters. The Terminal Data Link System (TDLS) D-ATIS application uses weather inputs from local automated weather sources or manually entered meteorological data together with preprogrammed menus to provide standard information to users. Airports with D-ATIS capability are listed in the CS. It is important to remember that ATIS information is updated hourly and anytime a significant change in the weather occurs. As a result, the information is not the most current report available. Prior to departing the airport, you need to get the latest weather information from the tower. 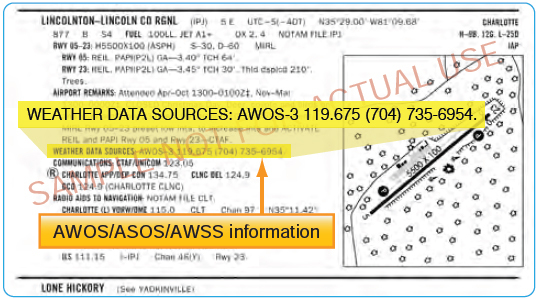 ASOS/AWSS and AWOS also provide a source of current weather, but their information should not be substituted for weather reports from the tower.